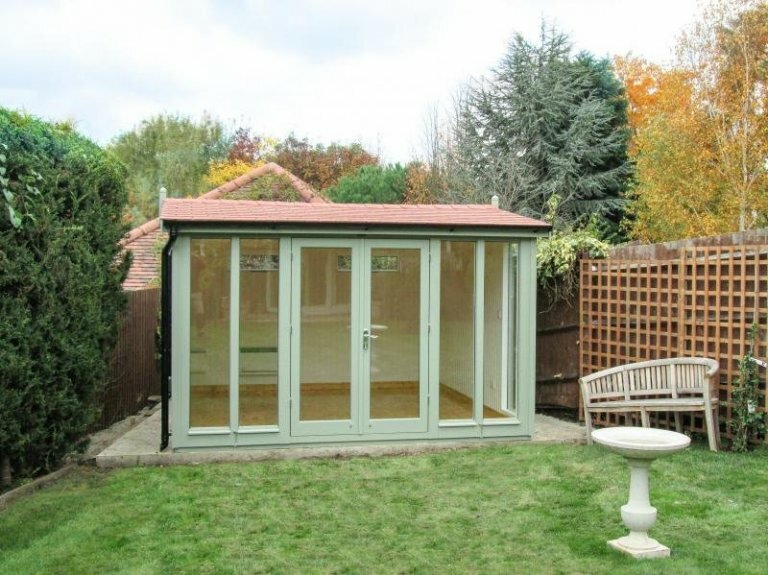 This attractive building is our Burnham Studio, and at 3.6 x 3.6m in size, it has been installed at the bottom of our customer’s garden in Essex to use as a relaxing garden room that they can use all year round. To match the colour of the tiles on the customer’s house, they chose to have terracotta slate effect tiles on the roof of their studio. These tiles are individually laid, and they provide the ultimate protection against UV rays, rain, wind, hail and fire, as well as looking very appealing. The customer also chose black guttering to go along the front of the studio, to help catch excess rainfall, and protect the doors and windows. The paint colour the customer chose is Lizard, which is a natural green colour with an opaque finish from our Valtti Paint Range. The full-length glass windows and doors are a modern touch to this building: they are all double glazed to help with year-round usage, and they help to fill the room with natural light. 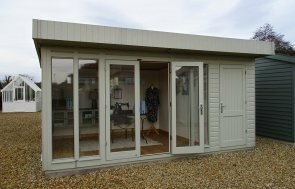 Our Garden Studios are all fully insulated, with draught excluders in the doors and windows, and matchboard lining. This customer chose to have painted matchboard lining, as well as having a Light Oak lacquered floor, and an electric pack with a heater. 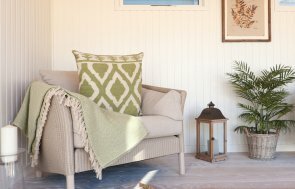 If you like the idea of having a garden building that you can relax in, in comfort, all year-round, please also peruse our ranges of Garden Rooms and Summerhouses to look at our design styles. For more information please either visit us at one of our national show sites, or click the link below to navigate to page dedicated to the comprehensive range of garden studios we offer.